One of the main reasons I prefer board/card games to video games is the tactile sensation. I like to have things in my hands. It’s why I prefer reading a book to reading on a Kindle or why I prefer to browse an old-fashioned catalog over a website. There’s just something about touching pieces and seeing their shapes that I really enjoy. When I opened the box to String Safari and saw actual string in the box, a big part of me smiled and the other part was concerned. I was thrilled to see a unique component in there and intrigued about how that was going to fit into the gameplay. I was also a bit worried about the same thing. And more importantly, how would this work for kids since they’re the target audience for this game? 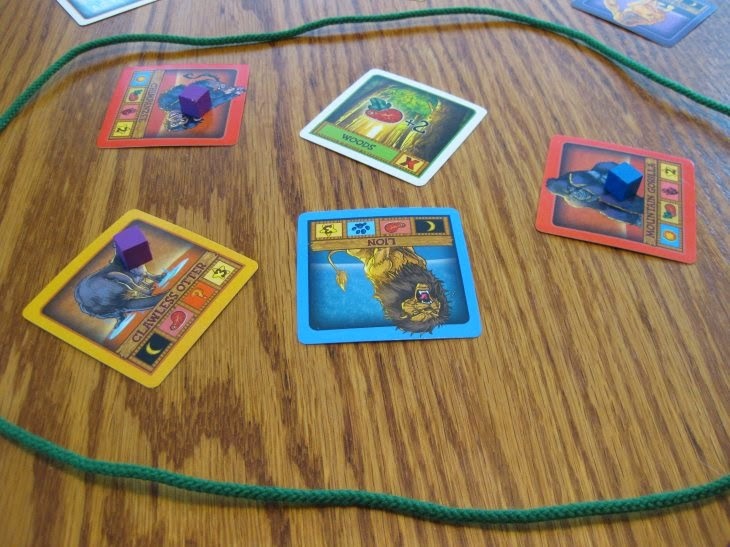 String Safari has a very simple ruleset which is ideal for kids. 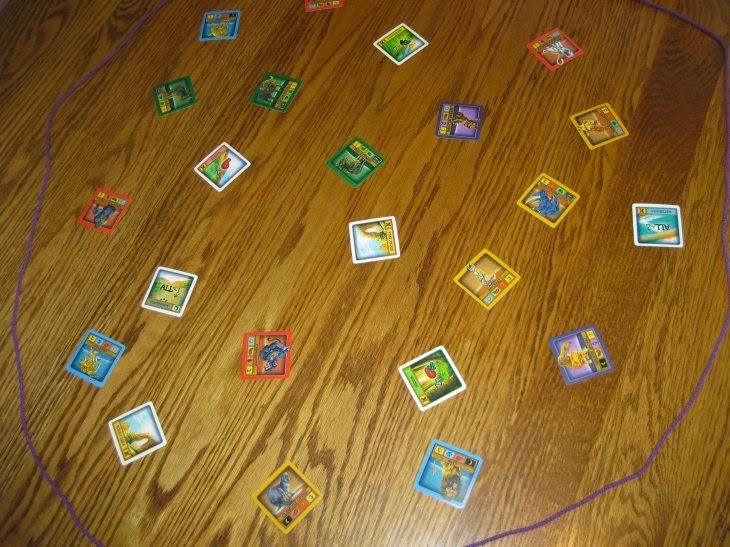 To start, the big string is laid out on the table and then 16 Animal cards are placed randomly in the circle along with the landscape cards. Lay out 5 Research cards face up and then let each player select one, placing it face-up in front of them. 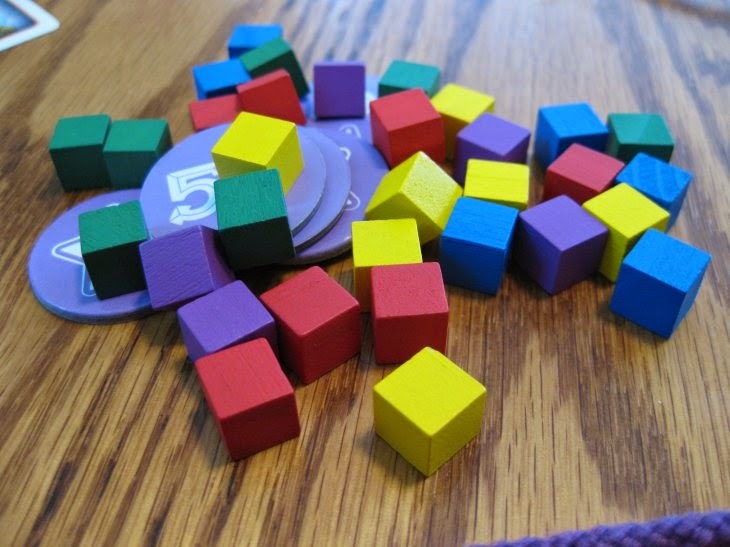 Give each player a number of colored cubes which varies by player count. The person who last went to Africa starts! Now that’s an unorthodox start player selector. In fact, if I sat at a table with someone who went to Africa recently, we’d probably sit there talking about it for hours. 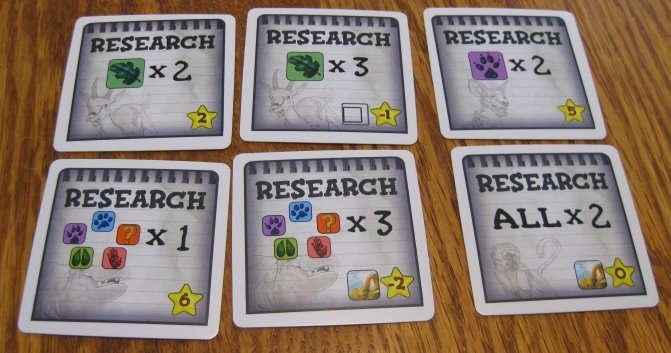 Each player takes a Research card and draws an Animal card. Turns are very simple. First, you place your animal card on the board. Next, you use the Research String to lasso a group of cards on the board. You then place one of your cubes on any animal you’ve lassoed. Lastly, draw a new Animal card and choose a new Research card to play on top of your current card. That’s it! Just that simple. Don’t let the simplicity of the rules fool you. There’s a legitimate game here and its driven by the Research cards. Each Animal card has 3 traits: Activity, Family, and Food with each trait having its own categories. The Activity category, for example, has Night, Day, and Evening as it’s categories. The Research cards will tell you how many points you get if you lasso Animals whose category matches the Research card. For example, if your Research card shows “Night X3”, then you will want to lasso Animals that show that the Night icon to maximize your points. Some cards also feature an icon at the bottom that tells you how you have to interact with the play area. Some cards specify that the Research string must touch the border string. Others specify that you have to enclose a rocky landscape card with your lasso. To add just a bit more, each of the Research cards is worth points at the end of the game. These things all add up to create a nice layer of choice around which Research card you take each turn. Your decision is also tied to the Animals on the board and how they are laid out. There's only one animal left to put a cube on here. When you lasso Animals, you then put one of your cubes on that Animal. At the end of the game, that Animal will score points for you. However, when you are lassoing Animals, you don’t score points for any Animals that have Research cubes on them. Essentially, an Animal can only be researched once. This also feeds into the decision of which Research cards to take because you have to analyze the board and figure out where your best bet for points is. The name of the game comes from the Research string so I’d be remiss to not talk about it. Each turn, you use the Research string to lasso Animals that match your Research card to score you points and also so you can mark Animals for end-game scoring. There are a couple rules to laying the string to make it a bit tougher: You can’t touch any Animals or Land cards and the string can’t cross over itself. Navigating this thing between Animals can be really difficult so you have to carefully place it and move it delicately. It definitely doesn’t like to move how you want it to. This is also one of those beautiful rules where kids can sometimes do much better. Their little fingers tend to work really well. Games like Gulo Gulo also take advantage of that aspect. Here, it can often level the playing field significantly. String Safari has plenty of choices and fun to be good for adults, but this is primarily aimed towards children and families so how does it work? In the games I’ve played with kids, I’d say it works incredibly well. First off, String Safari offers several learning opportunities. The Traits on the Animal cards are great for teaching kids about different types of animal behavior. You can teach them about herbivores vs. carnivores, diurnal vs. nocturnal, and about the different animal families and how they act in the wild. There’s also a lot of simple math with adding up points and some very basic multiplication so the kids get some arithmetic practice. Matching the animals to the research tiles will teach the kids about pattern recognition and gives them “gaming 101” on the concept of goals. Maybe most important of all, manipulating the string teaches them fine motor skill controls. It’s all done smoothly and will leave them having fun without catching on that they’re learning. Secondly, the game looks awesome. Kids are drawn to the "board" being a piece of string because it's unusual. They've been typically enamored with the different animal cards. Best of all, they love lassoing animals with the string. It's so cool to watch a child work that string in such a way as to get all the animals they want. You can almost watch them process it before they put the string down. In many ways, this is one of the most enjoyable aspects of the game. Don’t sell this one short as just a kid’s game, though. There’s enough fun here for adults to enjoy themselves with or without kids at the table. In fact, I’ve played this one with just adults and it can get downright nasty. Since you can see other players’ research cards, you know what they’ll be going for and therefore you know which animals to target with your research cubes. It’s not super-cutthroat, but it does have interaction. If you want a family game that the kids will really like and won’t leave the adults bored, then String Safari is a great choice. It plays quickly, has wonderfully engaging mechanisms, and looks great on the table. There’s plenty of decision-making for old and young minds alike. The Research string can level the playing field quite nicely and keep everyone in the game. Overall, an awesome presentation that could very easily find itself on the shelves of big-box toy stores as well as hobby game stores. It’s unique enough to satisfy a wide range of players and that makes it a success.